BACKGROUND: Road traffic injuries are a leading cause of death and may be related to social inequality. 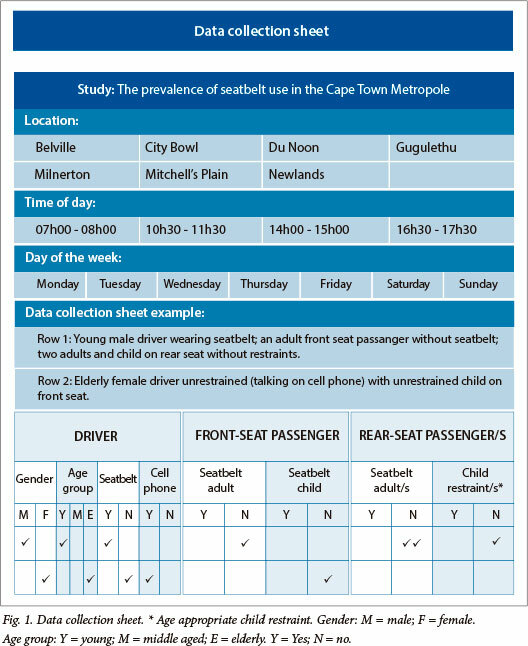 OBJECTIVE: To establish whether patterns of seatbelt use vary between different socioeconomic communities in the Cape Town Metropole, South Africa. METHODS: Vehicles and their occupants at 7 high-volume crossings (3 in high-income areas) were placed under surveillance for 2 hours each during November 2010. All occupants were eligible for inclusion except occupants of non-motorised vehicles, two-wheel motorised vehicles, buses, taxis, heavy goods vehicles and emergency vehicles. Child seatbelt use was recorded only for children who appeared older than 3 years. RESULTS: A total of 4 651 vehicles with 6 848 occupants were surveyed. Rates of seatbelt use were 45.1% (n=3 090) for all occupants, 54.0% (n=2 513) for drivers, 33.1% (n=521) for front-seat passengers (adults 33.2%, n=452; children 32.7%, n=69) and 9.0% (n=56) for rear-seat passengers (adults 4.0%, n=13; children 14.4%, n=43). Occupants from high-income areas were more likely to wear seatbelts (odds ratio (OR) 4.35; 95% confidence interval (CI) 3.89 - 4.88). Use of child restraints was poor overall (22.3%, n=114), but also varied according to income areas (high income 40.9%, n=99; low income 0.03%, n=6; OR 26.77; 95% CI 11.44 - 62.63). DISCUSSION: The impact of road traffic injuries is significant, but can be decreased by using appropriate restraining devices. Seatbelt use in South Africa, although compulsory, is neither strictly adhered to nor enforced. Their use is proportionally lower in lower-income areas. Specific interventions are required to target these communities directly. Road traffic injuries are among the leading causes of death worldwide, resulting in an estimated 1.24 million deaths annually. This loss of life is comparable in scale to that caused by only the most pervasive communicable diseases, such as malaria and tuberculosis. Middle- and low-income countries are disproportionately affected by road traffic injuries. Eighty percent of road traffic deaths occur in countries that have 72% of the world's population, but only 52% of the world's registered vehicles. This trend is further illustrated when the latest overall global road traffic fatality rate (18 deaths per 100 000 population) is divided into high-income countries (8.7/100 000), middle-income countries (20.1/100 000) and low-income countries (18.3/100 000). Large disparities also exist between regions, as well as between countries in the same region. Africans have the highest risk of dying from a road traffic injury (24.1/100 000 population). In the African region, Nigeria and South Africa (SA) have the highest fatality rates at 33.7 and 31.9 deaths per 100 000 population per year, respectively. Age-specific driver mortality rates in Africa were highest in the youngest age group (15 - 29 years), with 3 out of every 4 deaths being of males. [3-4] Economically disadvantaged families are hardest hit by deaths of those entering their most productive years, as a result of both loss of income and direct medical costs. In the USA during 2009, more than half (53%) of fatally injured passengers were unrestrained. It is further estimated that 13 000 lives were saved by seatbelts that year in the USA alone, and this number could have increased by another 4 000 if all occupants had used seatbelts. Another reason to wear a seatbelt is to prevent ejection from the vehicle; more than 75% of people ejected from the vehicle during a collision eventually die from their injuries. Occupants not wearing seatbelts are 30 times more liable to be ejected and killed than those who were 'buckled up'. A disturbing trend is also seen in children. According to statistics from the Child Accident Prevention Foundation of South Africa, 84% of children in vehicles are not restrained and 80% of children who had been injured in collisions were not restrained. In Bloemfontein, restraints were used for only 8.8% of children. SA has had numerous road safety strategies in place, but it is not clear how effective they have been in reducing this burden of disease. The fact that fatal injury levels remain largely unchanged year-on-year suggests that current strategies are falling short. Determining local patterns in road behaviour between different socioeconomic groups has the potential to allow an evidence-based approach to help reduce road traffic collisions in the future. 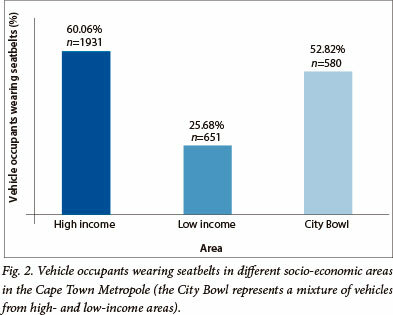 To establish how patterns of seatbelt use vary between different socioeconomic communities in the Cape Town Metropole, SA. Emergency Medical Services in the Western Cape undertook an audit of seatbelt use, and the Division of Emergency Medicine in collaboration with the Division of Civil Engineering, Stellenbosch University, retrospectively analysed the data. The study was approved by the Stellenbosch University Human Research Ethics Committee (ref. N11/03/080) and the Western Cape Health Research Committee (ref. 2012 RP 06). Seven high-volume crossings in the City of Cape Town were identified (Table 1). Three of these crossings were situated in traditionally high-income areas (Bellville, Newlands and Milnerton) and 3 in traditionally low-income areas (Mitchell's Plain, Gugulethu, Du Noon). One crossing was situated in the City Bowl itself and served as a 'hybrid' where people from different socioeconomic areas mix. The crossings were under surveillance for two 1-hour sessions: an hour during rush hour (07h00 - 08h00 or 16h30 - 17h30) and an hour during less busy periods (10h30 -11h30 or 14h00 - 15h00). The surveillance was done on random weekdays and weekend days. Students from the Division of Civil Engineering worked in pairs to collect the data during November 2010. All adult occupants (>14 years) of vehicles were eligible for inclusion, with the exception of occupants of non-motorised vehicles, two-wheel motorised vehicles, buses, taxis, heavy goods vehicles and emergency vehicles. Child seatbelt use was recorded only for children who appeared older than 3 years of age, SA seatbelt legislation currently prescribing the use of seatbelts for children from this age upwards. Children younger than 3 years currently do not have to be restrained, itself a concern. Variables were collected on a standardised data collection sheet (Fig. 1). Collected data were transferred onto a password-protected electronic spreadsheet (Microsoft Office Excel 2007). 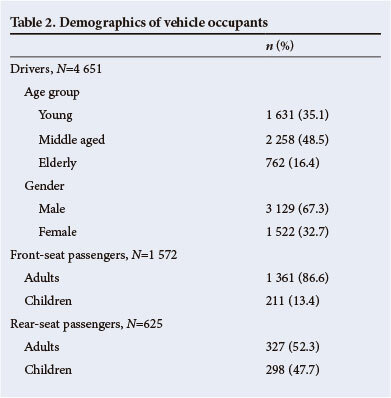 The primary aim of the retrospective analysis was to compare the percentages of seatbelt use in different socioeconomic areas in the Cape Town Metropole, and to disaggregate these results by age and gender. For this purpose, odds ratios (ORs) with corresponding 95% confidence intervals (CIs) were calculated and compared between the different variables (OpenEpi version 3.01, http://www.openepi.com). A 5% level of significance was used. A total of 4 651 vehicles, with 6 848 occupants, were surveyed (Table 2). Rates of seatbelt use were 45.1% (n=3 090) for all occupants, 54.0% (n=2 513) for drivers, 33.1% (n=521) for front-seat passengers (adults 33.2%, n=452; children 32.7%, n=69) and 9.0% (n=56) for rear-seat passengers (adults 4.0%, n=13; children 14.4%, n=43). Vehicle occupants in high-income areas were generally more likely to wear seatbelts than those in low-income areas (OR 4.35; 95% CI 3.89 - 4.88), with a combination of the two effects evident in the City Bowl area (Fig. 2). Drivers from high-income areas were 3 times more likely to wear seatbelts than their counterparts from low-income areas (high income 66.0%, n=1 585; low income 34.7%, n=524; OR (adjusted for age and gender) 3.02; 95% CI 2.62 - 3.45). This trend continued in the passenger group, where 42.5% (n=346) used seatbelts in the high-income areas compared with 12.4% (n=127) in the low-income areas (OR adjusted for age and position in vehicle 5.66; 95 % CI 4.43 - 7.22). The influence of the driver wearing a seatbelt on seatbelt use by other occupants in the vehicle revealed an overall adjusted OR of 11.3 (95% CI 8.47 - 15.09; OR adjusted for age, gender and income areas). When divided into income areas and adjusted for age and gender, low-income areas were again worse off (high-income adjusted OR 10.25; 95% CI 7.09 - 14.84 v. low-income adjusted OR 13.3; 95% CI 8.36 - 21.16). Use of child restraints was poor overall (22.3%, n=114), but also varied between socioeconomic areas. Children in high-income areas were significantly more likely to wear seatbelts than children from lower-income areas (high income 40.9%, n=99; low income 0.03%, n=6; OR 26.77; 95% CI 11.44 - 62.63). This study demonstrates a decline in seatbelt use compared with previous SA studies. Olukoga and Noah documented use of 81% by drivers, 50% by front-seat passengers and 8% by rear-seat passengers. Their data were obtained during countrywide road blocks when occupants might have been prompted to 'buckle up' when approaching the roadblock, therefore overestimating the seatbelt compliance rate. The Automobile Association of South Africa subsequently recorded lower seatbelt wearing rates in drivers (64%) and front-seat passengers (41%), but significantly higher rates in rear-seated passengers (24%). This study, although smaller, used a similar surveillance methodology to our study and the results should therefore be comparable. Seatbelt wearing rates are mainly dependent on mandatory seatbelt laws and the enforcement of such legislation. The South African National Road Traffic Act stipulates mandatory seatbelt use for both front- and rear-seat vehicle occupants. Enforcement of this legislation must improve - SA has rated its own seatbelt law enforcement as only 2 out of 10 (only 25% of all countries rate their seatbelt enforcement as 'good', i.e. 8 or above). The financial burden of road traffic deaths and injuries is substantial. It includes direct (arising out of medical treatment) and indirect costs (arising from loss of productivity and income), and affects the victim(s) and their dependants as well as impacting on the region or country. In the City of Cape Town during 2005, a total of 660 persons were killed in road traffic collisions (almost 2 a day), while 16 317 were injured (almost 45 a day), resulting in an approximate annual cost of R2.7 billion.™ Globally, road traffic collisions cost countries up to 3% of their gross national product. The majority of persons in lower-income areas in the Cape Town Metropole earn less than R2 500 per month, making it unlikely that they would be able to afford life or medical insurance; in the event of death or serious injury, household members are potentially left without income. The Socorro Seatbelt Programme serves as an example of how a change in the perceived norms in a community (i.e. making non-use of seatbelts less socially acceptable) can increase seatbelt use. The programme consisted of didactic teaching sessions, role-model stories, seatbelt newsletters and a family slogan and poster contest, all with the support of the local church. Education programmes to change high-risk road behaviour are known to be beneficial, but are not always affordable.™ Furthermore, lower-income populations are more likely to drive older vehicles, many of which may not have rear seatbelts, the installation of which is costly. Age-appropriate child restraints (child seats, booster cushions, etc.) are currently not required by SA law. They are also not supplied by vehicle manufacturers and the cost of installing them is for the vehicle owner's own account. Elsewhere, free distribution of age-appropriate child restraints combined with education regarding their use has proved to be beneficial.™ Similarly, incentives (e.g. discount coupons or gift certificates) combined with education have improved uptake of the use of restraining devices. The main limitations of the study are, firstly, the possibility of inaccurate estimation of the occupants' age; however, we do not believe that this affects the conclusions. Secondly, the specific areas, the high-volume crossings in those areas and the four time periods were not selected randomly. Nevertheless, the chosen areas and crossings are considered representative of the different socioeconomic classes in the City of Cape Town. Thirdly, the non-inclusion of nights could potentially have skewed results towards overestimation of the percentage of seatbelt use, as driving behaviour at night tends to differ from that during the day. Lastly, the study reflects only the use of restraining devices and cannot comment on the functionality of the devices used. The impact of traffic injuries is significant, but can be decreased by use of seatbelts and appropriate child restraining devices. Seatbelt use in SA, although compulsory, is neither strictly adhered to nor enforced. Their use is proportionately lower in lower-income areas, suggesting that specific interventions are required to target these communities directly.